In 2016, the Department of Education released a report, “STEM 2026: A Vision for Innovation in STEM Education,” that outlines how school districts can carry forward the STEM goals set by the Obama Administration for the next decade. The report cites six tenets for success, all of which have been embraced by the robots4STEM coding and programming curriculum to build the next generation of savvy employees equipped to thrive in a digital world. Accessible learning activities that create learner agency: Success in business – and in life – hinges on the ability to take smart, calculated risks, but too often, children are taught to be risk-averse, setting them up for self-imposed limitations in the future. Fundamentally, learning to code is about taking a risk. 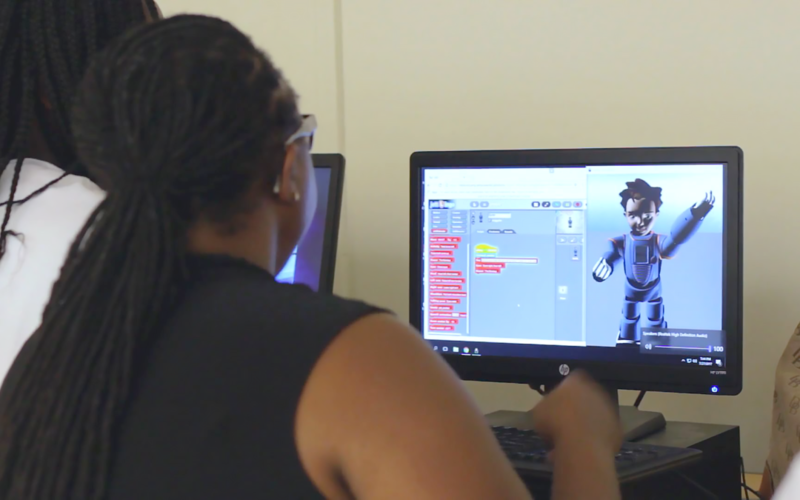 Coding with robots4STEM provides students with a safe environment to make mistakes and learn how to fix them, empowering them to really explore, co-create and grow in a controlled, innovative and creative environment. Educational experiences that include interdisciplinary approaches to solving “grand challenges”: At first blush, coding can seem like a narrow way to address the need for STEM skills. However, the benefits of coding are broad, and cover the 5 Cs that are key to digital citizenship: collaboration, communication, creativity and critical and computational thinking. The 5 Cs benefit students across all disciplines – imagine designing a bridge without collaborating with engineers and contractors, or assessing the assorted works of William Shakespeare without any critical thinking skills. Coding as a discipline may seem narrow, but its lessons and takeaways are far-reaching. Flexible and inclusive learning spaces: Students learn in various ways – no two children are alike. Curricula that have the highest impact across the board are implementable in a variety of settings – in the classroom, at home, during after school clubs and activities or outside of the school environment altogether, through groups like Scouts or 4-H. robots4STEM embraces this flexibility and offers structured, self-paced and competency-based lessons that students, teachers and parents can implement when it makes sense. Engaged and networked communities of practice: The best STEM programs encourage students to learn and demonstrate the soft skills that will stay with them for life, and follow them into any career they choose. From a community standpoint, this requires a shift in thinking: Rather than focus on the typical testing model of education, where the goal is the test score or destination, educators and their networks need to focus on the journey of learning, a concept that is emphasized in the curriculum structure of robots4STEM’s next-generation coding and programming platform. Innovative and accessible measures of learning: For learning to be impactful, it must also be fun. The facially expressive Jett robot from robots4STEM allows students to see their coding come to life in front of them, giving them immediate feedback on their actions. It’s also easy for teachers to implement without requiring a background in STEM education or coding. Badges are assigned as each level is completed, giving students visual representation of their achievements. Societal and cultural images and environments that promote diversity and opportunity in STEM: We all know how important it is to foster diversity in STEM learning to ultimately develop a larger skilled workforce. According to Pew Research Center’s January 2018 findings, black and Hispanic workers make up only 16 percent of the STEM workforce – though they collectively represent 27 percent of the workforce overall. These statistics demonstrate two things: society’s disservice to minority groups when it comes to STEM education, and a loss of creativity from those groups not contributing to STEM fields. robots4STEM is helping to address the gap by providing robots that reflect the gender and ethnicity of the students they serve. As the Department of Education report notes, “The learning and doing of STEM helps develop these skills and prepare students for a workforce where success results not just from what one knows, but what one is able to do with that knowledge.” Therefore, it’s imperative that the education community look beyond basic skills acquisition, and teach STEM topics with a framework for ongoing, long-term success.